Died: June 4, 2004 in Operation Iraqi Freedom. Unit: Army National Guard, 3rd Battalion, 112th Field Artillery, Army National Guard, Lawrenceville, N.J. 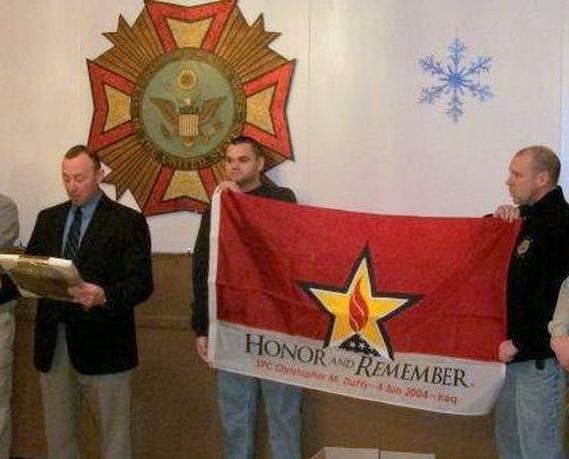 Brick Township is mourning the loss of its first armed service member killed in combat operations in Iraq or Afghanistan. N.J. Army National Guard Spc. 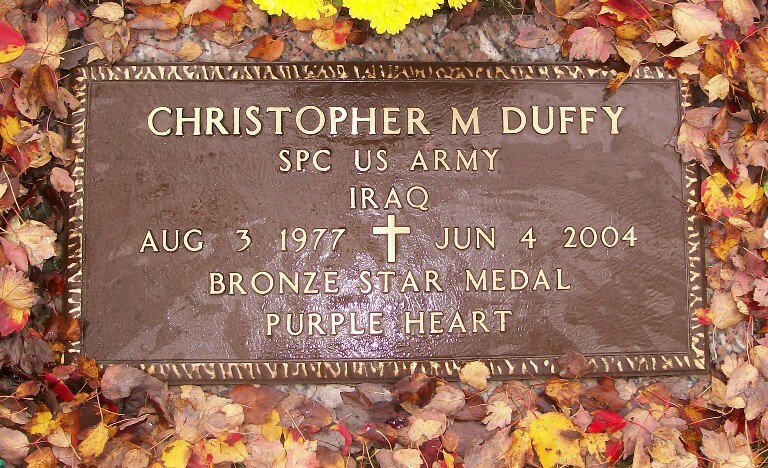 Christopher M. Duffy, 26, was one of two guardsmen killed in a convoy while traveling east of Baghdad Friday. Also lost was Sgt. Frank T. Carvill, 51, of Carlstadt, who served with Duffy in Battery B, 3rd Battalion of the 112th Field Artillery, headquartered in Lawrenceville. Born in Neptune, he lived in Brick all his life. 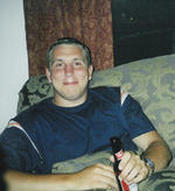 He was a specialist for the Army National Guard serving in the Iraq Conflict. Chris was a man of good character and honor who was fulfilling his commitment to his country. He truly believed that he was making this world a safer place for his wife, son, family and everyone. His wife and family are extremely proud of him. As Chris would say, he "was doing what needed to be done." It will forever be known that Chris was always taking care of someone else and that he was a true American hero. His wife and family ask that you remember in your prayers, thoughts and deeds the other member in Chris' unit and their families that continue to serve in Iraq. Prior to serving in Iraq he worked as a butcher for Lenny's Silverton Market. He was a CYO basketball coach for Church of the Visitation and enjoyed numerous sporting activities. Chris is survived by his wife Casey (Ryan) Duffy; his son Ryan Duffy of Brick; his father Brenden Duffy of Brick; sister Rachel Duffy of Jackson; grandmother Bernadine Duffy of Point Pleasant Beach; uncle and aunt Alex and Sandy Grebel of Point Pleasant, and other aunts and uncles; cousins Ryan and Alex Grebel, and several other cousins; nephew Damian Silva; and his in-laws, the Ryan Family. Funeral services will begin 11 a.m. Friday at Weatherhead Young Funeral Home, 885 Mantoloking Road, Brick. A Committal service and Interment will follow at Ocean County Memorial Park, Toms River.